The DSP Laboratory is playing an important role to bring advanced DSP research work into practical realization. Over the past few years, the DSP Laboratory has developed into a well-recognized lab. We have also been widely consulted in areas in real-time DSP implementation, applications and programming. There is a constant need for designing systems with lower power, higher speed and lower area. The DSP/VLSI Laboratory is equipped with hordes of personal computers. The students enrich their knowledge by using the software tools like MATLAB, MODELSIM and Xilinx. Microwave devices are fundamental to many modern electronics systems, including digital wireless communications. We have active research interests in developing and characterizing microwave components and systems with particular expertise in low phase-noise oscillators, filters and power efficient amplifiers. In Microwave Laboratory, the students are exposed to the microwave active devices like klystron, Gunn diode and passive devices isolator, circulator, slide screw tuner, magic tee, directional coupler, horn antenna, attenuator and terminations. The students perform all the experiments as prescribed by the university. Optical and Optoelectronic Semiconductor devices and subsystems permeate modern communications and information storage and are also increasingly important in medical, environmental and industrial applications. The students perform experiments to study the characteristics of optical sources (LED & LD) and optical detectors (LD & APD) and optical fibers. Fault detection in a fiber link is studied using the OTDR module. A FSO module enables study of Transmission of optical signal in free space. The Laboratory is equipped with connecterization and splicing kits. Communication Engineering Laboratory focuses on training the students in both analog and digital transmission/reception of signal. The students here start in the analog area by constructing the circuits of amplitude modulation, frequency modulation and phase modulation. The other important area of analog signal processing is the phase locked loop. Electronics Laboratory is spacial and well equipped with the latest signal generators, oscilloscopes, digital trainer kits and measuring instruments. Students of various branches design and test their analog/digital/mixed signals, digital circuits as part of their curriculum. Linear Integrated Circuits & Simulation Laboratory is very important for designing the characteristics of OP-AMP, 555 Timer IC and to simulate the applications of OP-AMP. It is also used for designing the Electronic circuits-1. Students of various branches design and test their circuits as part of their curriculum. 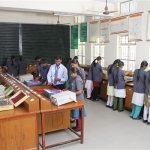 Guidance is provided to the students by a team of expert faculty and lab-technicians. 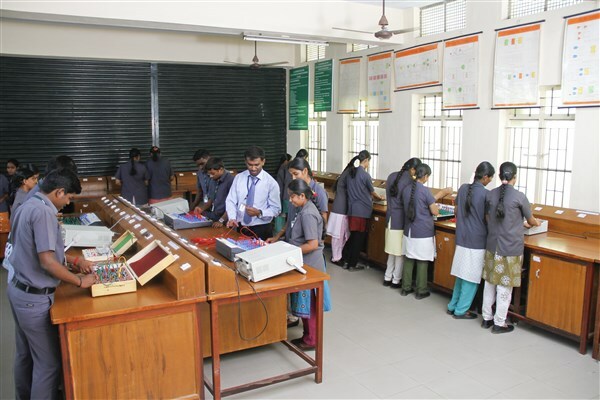 The labs are kept open after the college hours to enable the students to engage themselves in designing /testing the circuits in their leisure hours. Students are grouped into small teams and guided to do their mini projects by using the facility mentioned below. The rapid development within the field of Embedded Systems Design that has taken place over the last years offers new possibilities for designers of Home Appliances, Industrial monitoring and controlling devices, Medical Instrumentations etc. The department of Electronics and Communication is setting a full-fledged Embedded Systems lab keeping in mind the current trend so as to produce industry ready employees. The lab will have processors with 8bit, 16bit and 32bit processing capabilities. The lab will be equipped with most sophisticated development boards for final year projects. The lab is aiming to design good quality products for the present electronics market. Inspite of Hardware components we also provide Simulation Software for designing an Embedded System.